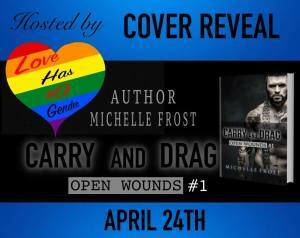 Cover Reveal: CARRY AND DRAG ( OPEN WOUNDS #1 ) A DEBUT BOOK BY MICHELLE FROST @MFrostWrites @IARTG @Jo_isalovebooks @isajones75 – Imagination and information for book's. Qualifying to compete on a national level is all that’s on power lifter Dagen Rourke’s mind. After an injury sidelined him the previous year, his only goal has been to overcome the physical challenges and mental demons to get back in the game. Falling into bed with the new artist at his brother’s tattoo shop was never part of his training schedule. Now he has to find a balance between the time he wants to give Ollie and the brutal training for what could be the most important competition of his life. Run. Tattoo. Doze. Keep going.